Fuzzball & Scuzzball - So . . . Heavy! Comic 21 - So . . . Heavy! And we get to this page. This is Mr. D.F. French's next-to-last page and, in my opinion, easily his weakest. D.F.F. is, as I mentioned earlier, much better at drawing than I am. Look back at page 3, his first page in this story, and see how carefully placed each line is. He designed the storefront and the pawn shop guy, conveyed the pawn shop guy's attitude through body language, created mood through shading . . . and did all that in just a few minutes. That page was drawn by a man who was focused. This page, however, was drawn by a hungry man eager to eat his dinner, who clearly wanted the comic to be over with. I may have a more limited range of art skills, but you can say this about me--at least I'm consistent. My last page looks about as good as my first. I polished this page up some when I inked it, so you can't see just how rushed and sloppy it originally looked, but I think that spirit is still there. 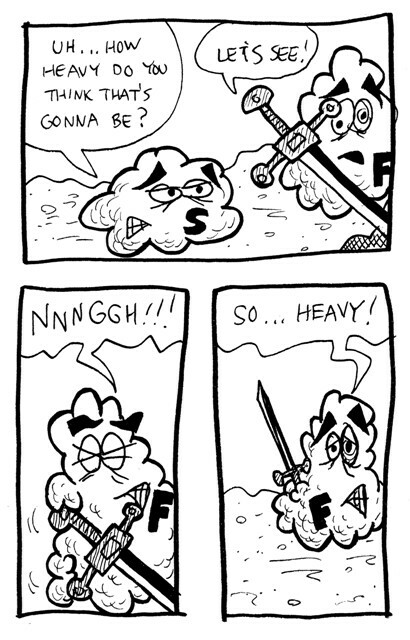 Worse, notice that we've just spent three panels establishing that the sword is heavy. I'm not sure what the point of that was. I'm happy to say, though, that D.F.F. has one more page to go, and that one is much better. It's possible I was too negative here . . .